The next upcoming Simchat Torah starts on sundown of Monday October 21st ending at sundown on Tuesday October 22nd, 2019. Simchat Torah which means rejoicing with the Torah on the Hebrew calendar falls on 22 Tishrei (Israel) and 23 Tishrei (outside Israel). 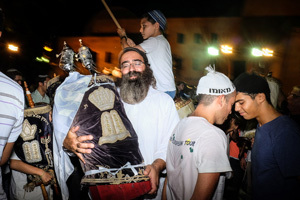 In Israel many will celebrate both Shemini Atzeret and Simchat Torah on the same day which happens to follow directly after the seven day holiday of Sukkot. Outside Israel many Jews will celebrate Simchat Torah the day after Shemini Atzeret is celebrated thus celebrated on 23 Tishrei. This day celebrates the ending of the Torah readings for the year and people will celebrate with dancing and singing in the synagogues with the Torah scrolls taken out of the ark to be read to all attendees and celebrated with. Sometime around the 16th century the tradition of taking the scrolls out on 23rd of Tishri in the evening and moving around with the scrolls and reading them became more popular with the Jewish religion.